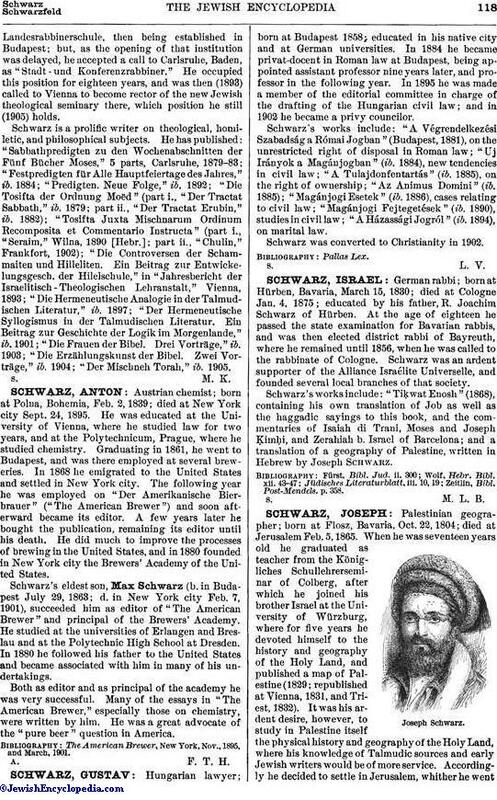 Austrian chemist; born at Polna, Bohemia, Feb. 2, 1839; died at New York city Sept. 24, 1895. He was educated at the University of Vienna, where he studied law for two years, and at the Polytechnicum, Prague, where he studied chemistry. Graduating in 1861, he went to Budapest, and was there employed at several breweries. In 1868 he emigrated to the United States and settled in New York city. The following year he was employed on "Der Amerikanische Bierbrauer" ("The American Brewer") and soon afterward became its editor. A few years later he bought the publication, remaining its editor until his death. He did much to improve the processes of brewing in the United States, and in 1880 founded in New York city the Brewers' Academy of the United States. Schwarz's eldest son, Max Schwarz (b. in Budapest July 29, 1863; d. in New York city Feb. 7, 1901), succeeded him as editor of "The American Brewer" and principal of the Brewers' Academy. He studied at the universities of Erlangen and Breslau and at the Polytechnic High School at Dresden. In 1880 he followed his father to the United States and became associated with him in many of his undertakings. Both as editor and as principal of the academy he was very successful. Many of the essays in "The American Brewer," especially those on chemistry, were written by him. He was a great advocate of the "pure beer" question in America. The American Brewer, New York, Nov., 1895, and March, 1901.